While the home telephone enabled real-time communication, and the web passive communication, messaging enables constant communication. Conversations are never ending, and friends come and go at a pace dictated not by physicality, but rather by attention. And, given that we are all humans and crave human interaction and affection, we are more than happy to give massive amounts of attention to messaging, to those who matter most to us, and who are always there in our pockets and purses. This, by extension, dictates that messaging is incredibly valuable: in a world of effectively infinite content and zero distribution costs the only scarce resource is attention, and if messaging is indeed the recipient of “massive amounts of attention” it has massive value. That excerpt may look familiar: I used it just a few months ago to discuss Slack. In the enterprise the application where workers live has an excellent opportunity to be the layer that ties increasingly disparate cloud services together, and there’s even an outside chance Slack could be the rare enterprise product that crosses over into the consumer space. Unless, of course, Snapchat gets there first. I wrote about Snapchat’s huge market opportunity just over a year ago in a piece called Old-Fashioned Snapchat. At that point Snapchat was already very entrenched with teens in the United States in particular, but over the last year — particularly the last few months — it seems the service has started to cross-over to a broader audience. The big challenge in getting a messaging service off the ground in the United States is that, unlike the rest of the world, text messaging has long been free. The reason this matters is that while it is very difficult to get even one person to change their habit or workflow, it is exponentially harder to get a critical mass of people to change all at the same time. However, if there is a fantastic benefit that appeals to everyone the challenge is a lot easier, and there is no better benefit than offering for free a service that used to cost money. 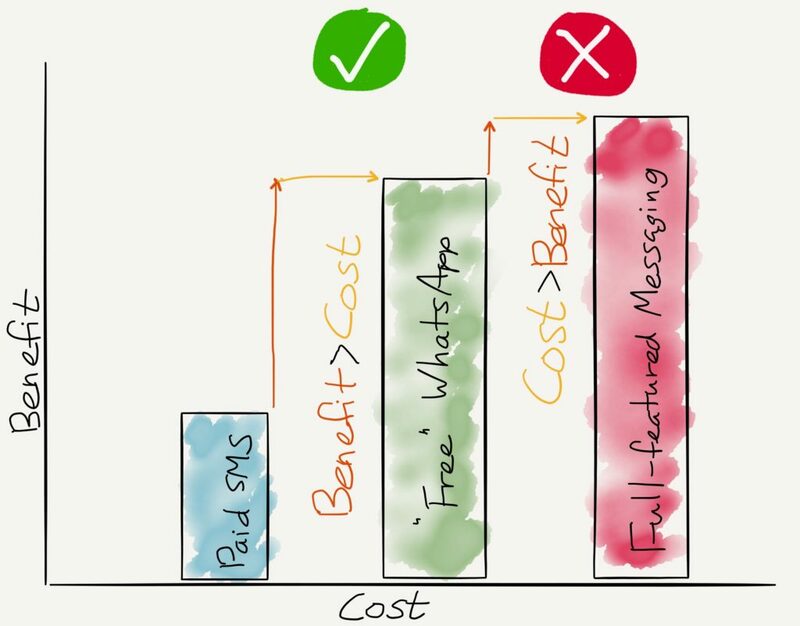 This, above all, is why WhatsApp in particular was able to become the fastest growing social network of all time, even with a skeletal team of engineers: the company basically offered text messaging for free just as people were getting their first smartphones,2 which was a delta of improvement that significantly exceeded the cost of changing how you and your family and friends communicated. LINE and Kakao did the same in parts of Asia3, and WeChat quickly came to dominate China. Note too that the latter three services offer significantly more functionality than WhatsApp, but in fact little has changed when it comes to which service dominates which countries: whatever improvements the Asian apps offered relative to WhatsApp weren’t significant enough to overcome the barrier of changing people’s habits en masse. Meanwhile, as I noted, the United States had free text messaging: it is not a coincidence that none of the messaging services have made much of an impact. Except, of course, Snapchat. You know, the teen sexting app. I obviously say “teen sexting app” tongue-in-cheek, but it’s worthwhile to understand just how it was that Snapchat got off the ground. In a world dominated by Facebook (and to a smaller extent Twitter) Snapchat offered something unique that couldn’t be easily copied by the existing services: chats that disappeared immediately. Beyond the fact this is much more akin to how we actually talk in the real world, disappearing messages were particularly attractive to teens put off by the prospect of their parents, future admissions officers, future employers, and whoever else spying on what they said. Moreover, the primary means of communication was not text but rather a picture, often a selfie. Again, this more closely corresponded to how people actually communicate — non-verbal communication with our face is even more important than verbal — and also appealed particularly strongly to teenagers: while everyone is ultimately mostly concerned about themselves, teenagers don’t even bother to pretend otherwise! These two factors worked together to magnify Snapchat’s initial differentiation: the fact snaps disappeared removed whatever reticence teenagers may have had about sending their pictures, and the result was messaging that was far more personal than Facebook’s preening or Twitter’s broadcasting. The problem, as pundits far and wide would tell you, is that disappearing chats do not an advertising platform make. Snapchat’s entire point was in not tracking you like Facebook, and who was going to put up with advertisements stuffed in your selfies? This brings me to Netflix. You know, the DVD-by-mail company. Each of these intermediary steps was a necessary prerequisite to everything that followed, culminating in yesterday’s announcement: Netflix can credibly offer a service worth paying for in any country on Earth, thanks to all of the IP it itself owns. This is how a company accomplishes what, at the beginning, may seem impossible: a series of steps from here to there that build on each other. Moreover, it is not only an impressive accomplishment, it is also a powerful moat; whoever wishes to compete has to follow the same time-consuming process. Back when Netflix first got traction it was easy to dismiss it: DVDs were not long for this world, and the company had a nice niche but would ultimately fade away. But that was to focus on the first rung of the ladder, even as founder and CEO Reed Hastings was thinking several rungs ahead. What is so impressive about Snapchat’s rise has been how founder and CEO Evan Spiegel has shepherded the service along a similar path: today’s Snapchat, which received a major update yesterday, is a far different and richer product than it was when it launched, one that is appealing to far more people, that demands far more attention, and, critically, is far better placed to capture the value it generates. In October 2013, two years after the company’s founding, Snapchat added “Stories.” These collections of snaps (or short videos, added in 2012) were not exactly ephemeral — they lasted for 24 hours — but they weren’t permanent either: they were user-generated “shows” that forced you to use the app daily to not miss, and they could be private or public. Mobile is a great market. It is the greatest market the tech industry, or any industry for that matter, has ever seen, and the reason why is best seen by contrasting mobile with the PC: first, while PCs were on every desk and in every home, mobile is in every pocket of a huge percentage of the world’s population. The sheer numbers triple or quadruple the size, and the separation is increasing. Secondly, though, while using a PC required intent, the use of mobile devices occupies all of the available time around intent. It is only when we’re doing something specific that we aren’t using our phones, and the empty spaces of our lives are far greater than anyone imagined. Stories fill that void, and as I further recounted in that article, that void is particularly attractive to brand advertisers; add on the fact that, as I recounted last year, advertisers are desperate to reach teenagers, and suddenly Snapchat had the outline of a real money-making opportunity. Fast forward a year-and-a-half and Snapchat launched Discover, a place for media companies to post professionally-produced content, specifically tailored for Snapchat. This too was a natural extension of what came before: Stories were by users, and Discover was by the professionals. Moreover, Discover doubled-down on the benefits brought by Stories: first, they were another way to occupy more and more attention, and second, they were an even more natural advertising vehicle. Both of these points were important for similar reasons: first, Discover provided instant benefit for new users who didn’t yet have friends on the service. In this respect Discover resembled Instagram’s filters: they gave a reason to use the app without a network in place. Secondly, Discover was a natural place to experiment with the brand advertising that is Snapchat’s future: professional content has long been associated with professional ads. This brings us to yesterday’s release: Snapchat added (better) video chat, including an innovative one-way option; audio calls; audio notes; and stickers. The latter is particularly notable given that Snapchat just bought Bitmoji, an app that creates stickers that look like you. First off, many of the features Snapchat added build on the sort of functionality the company has added on previous rungs: specifically, video and audio calling not only cement Snapchat’s hold on communication but are also much more accessible to a much broader audience than inscrutable teenagers. Granted, these revenue numbers are relatively small, but then again LINE is smaller than Snapchat already (in Daily Active Users), and its markets have significantly fewer advertising dollars available. On the other hand, no company has mastered stickers like LINE has (including Kakao and WeChat), but this is why the Bitmoji acquisition is so intriguing: from day one Snapchat has tapped into the fact that our perspective is fundamentally selfish,4 and the potential to create stickers that are predicated on the same idea could be a lot more powerful than folks realize. Regardless, rung three has further increased Snapchat’s optionality, both in regards to its potential user base and its revenue stream. All of these rungs are climbing to a very lucrative destination: owning messaging in the United States. As I recounted above, unlike the rest of the world, there were no shortcuts to this market, which meant Snapchat has had to ladder its way up: first, by delivering an orthogonal product that appealed to an underserved market, and then leveraging that position into an array of products that have both expanded the addressable market and increased the service’s monetization potential. That’s not to say success is guaranteed: the development of the Snapchat product has been far more impressive than the development of Snapchat as a business. As I snarked a few weeks ago “‘turnover’ in the context of Snapchat has been more about executives than it has been about revenue.” Does Spiegel have the discipline and commitment to build a real business around his deeply considered app? It is here the parallel to Facebook is particularly interesting. What has made CEO Mark Zuckerberg’s leadership so exemplary is the degree to which the founder has been willing to not only surround himself with experienced executives but also learn and grow in areas in which he has no experience. The result is a company that not only delivers compelling products but is also deeply committed to its advertising business and, by extension, the success of those using Facebook to reach consumers. There’s no question Snapchat is a threat to Facebook: both trawl for attention, and that is a zero-sum game. Facebook, though, has become much more than a social network: it is the front-door to the Internet for one, and, as Alex Muir put it, the new Excel for any number of online activities. Anyone who uses Snapchat will also use Facebook, however begrudgingly, and that, in conjunction with Facebook’s already good and still improving targeting and tracking capabilities, ensures Facebook’s revenue potential is still in its adolescence. Moreover, Facebook is far stronger internationally than is Snapchat: all of those countries dominated by WhatsApp (a Facebook property) and LINE are equally dominated by Facebook;5 it seems there is a role for communications, a role for general browsing (which Facebook dominates), and a role for escapism (and here Instagram, another Facebook property, is a strong contender, albeit challenged by Snapchat). Still, that doesn’t make me bearish on Snapchat: as TV moves inexorably to a subscription-based on-demand model more and more advertising will move online, including lucrative brand advertising. Both Facebook and Snapchat will capture their fair share, and I’m with Zuckerberg: I’d love to own both. Next post: Exponent Podcast: Get Off My Lawn!